Conservative Rob Smith with Turning Point USA produced a video message for Jussie Smollet and all those who seek to continue dividing the nation. Democrat said it wasn’t possible – but they can’t say no this smart plan. There’s no two ways about it; President Donald Trump MUST deliver on his promise to the American people. Our national security is at stake and yes, we are indeed facing an immigration crisis. But Trump needs all the help he can get in this battle, which is why 5 Republican Senators have stepped up with a new proposal. If it passes, this will fully fund a southern border wall and unbelievably enough, it won’t cost taxpayers a dime! It’s called the WALL Act, which has been officially reintroduced this week. “Five Republican Senators reintroduced the WALL Act Tuesday, a bill to fully fund a wall along the U.S. southern border. ‘Their legislation, first introduced last December, is also the first bill that will fund the wall by identifying specific funding sources,’ read a Tuesday announcement from the five senators. The five are Senators are Jim Inhofe (R-OK), Mike Rounds (R-SD), John Kennedy (R-LA), Ted Cruz (R-TX), and Bill Cassidy (R-LA). ‘We need to build the wall,’ said Inhofe. Furthermore, Inhofe added that the WALL Act fully funds the wall without hurting American wallets. That’s right, no tax dollars needed! Sen. Kennedy said if you want those benefits, you’ll have to prove your U.S. citizenship, plain and simple. And by making this change, it would save taxpayers a whopping $33 billion every year! Sen. Cruz said that closing these loopholes – along with a new wall – will stop the flood of border jumpers almost entirely. All told, the WALL Act would provide $25 billion in funding for Trump’s wall, and it seems like a simple, perfect solution. We waste FAR too much money on order jumpers as it is; fixing the immigration loopholes and other problems would easily give us the funding. Don’t you think this is a fantastic idea, fellow patriots? 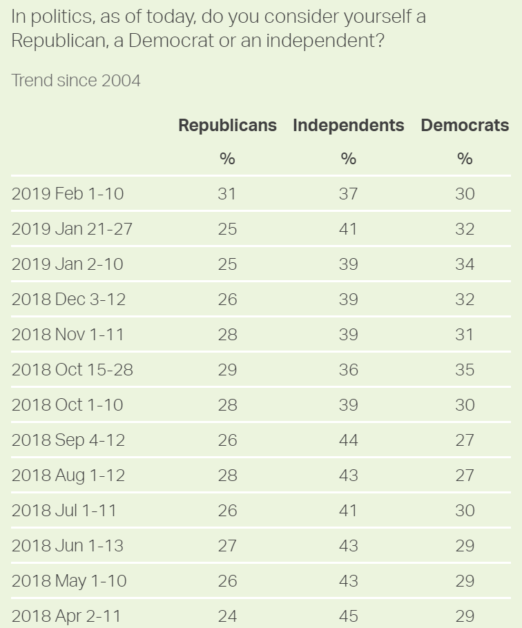 For the first time in years, the newest Gallup poll shows that there are now more Republican voters than Democrats.